Opinion (Efim Reytblat, engineer, founder of the science of gominisologii): “How could it happen that so far there is no science of humanity? There are a few sciences of the human (anatomy, biology, physiology, psychology, anthropology, gerontology); there is a science of society (sociology), and there is no science of humanity! There is a science of animals, and there is no science of humanity! How do humanity and man affect each other mutually? “The world order (humanity) should be aligned with the Laws of Nature. “The human system is characterized by the process of self-organization, vertical and horizontal connections. In case of unsatisfactory vertical ties, the control of the system of an individual is broken. In case of unsatisfactory horizontal connections, conflicts between societies arise. My Comment: Humanity cannot understand itself. We can understand only what is below us. In order to jump on a table, it is necessary to jump above the table. Therefore, the science of animals exists and there is the science of our animal body. But there cannot be a science about people, their communities, and even more so about humanity as a unified system of communities. We cannot have such a science and such precise knowledge before we rise to the level above our present state and from there, from above, begin to study ourselves. These are the possibilities and scope of the science of Kabbalah. Only through its methods is it possible to rise above our current level and reveal the true system of connection of humanity, its path and its goal. The state of Lo Lishma isn’t just an ordinary corporeal ego. Being in a state of Lo Lishma (not for Her sake) means that I try to be in a state of Lishma (for Her sake) and to perform actions of bestowal, and to discover time after time that I still perform them for my own benefit. The time during which I make efforts in order to ascend above my ego and to reach an action of bestowal but am still unable to do so is called the period of Lo Lishma. Question: Perhaps one time isn’t enough in order to invert my nature from Lo Lishma to Lishma. Answer: Of course it doesn’t happen all at once. There are 125 levels and each of them is divided into many more states. Baal HaSulam says that we don’t understand how great the state of Lo Lishma is. It is even much greater than we can imagine and think that the state of Lishma is. It is because the real state of Lo Lishma means that I do my best to perform an action of bestowal, with all my might, but eventually I discover that I still act as a result of the desire to receive, in order to receive an egoistic profit. Question: Is there a certain structure or an environment where one can enter in order to perform the necessary inversion? Answer: Yes, this is the role of the group. Question: Why did the Creator choose one nation for a special mission, and is this choice related to religion? Answer: The true religion is to love your friend as thyself. This is the rule that Abraham publicized in ancient Babylon, and he gathered the people around him according to this rule into a group called Israel, which means Yashar El (straight to the Creator). Only some of the people of Babylon followed Abraham; those who had greater vessels of bestowal. All the others had vessels of receiving. This was intentional so that they would have a chance to help one another. First the vessels of bestowal are corrected so that they can ascend to a spiritual level. When Abraham collected them, they had nothing. So first they had to go through the hardening of the heart called Egypt, that is, they don’t ascend but rather descend. 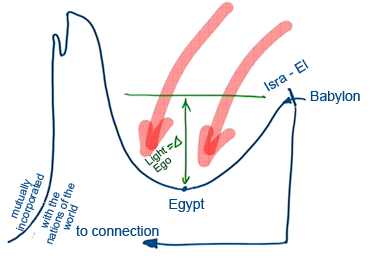 After the exodus from Babylon, they go down to Egypt, then come out of Egypt and ascend to the receiving of the Torah. They then cross the desert, build the first Temple, and fall. They ascend again to the height of the second Temple and go through another descent to the corporeal level. This is in order to be mutually incorporated with the nations of the world and get ready for the end of the correction of the world. The whole process, starting with the exodus from Babylon and everything that follows, is in order to reach greater connection. This is what Abraham taught. The moment they started to connect, they felt that they were in a greater and greater descent. The Light that shone on them made it possible for them to descend more and more deeply into their ego and to see that they were far from bestowal, from the Light. 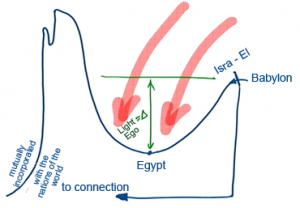 Therefore, they felt the gap, the delta between the state of the exile in Egypt and the level they were on when they left Babylon, and they would have remained on that level if it weren’t for the Light. This is the gap between the Light and our ego. Rabash, Letter 22: Therefore, if you write that you live a life of sorrow, it is a sign that you are following the path of the Torah. This means that you have black and white, since the Torah is written in black on top of white. But you have to try to have a black fire on top of a white fire, which means that everything that you feel will be as flaming fire. The road itself, how many twists and turns are on it and how many failures we have, is not up to us, but rather depends on the structure of our soul. Since the Creator wants us to receive the Torah, we must feel the deficiency for the Torah ourselves, since one is not given luxuries from Above, but only necessities. I will not receive what I ask for from Above unless my request is solely for necessities without which I cannot exist. Otherwise these are merely powerless requests. Of course, it takes a long time until a person comes close to a real prayer. First there should be the intensity of the request by which it can be heard. Second, it has to be for the right thing that is exactly on the path. A person should grasp onto a real part of the string on the path each time. If I ask for something now, my outcry may be correct, but perhaps it isn’t mine, and is instead arranged by the Creator. I attribute everything to myself, and this is totally wrong. I have to search myself more deeply and find out who directs me, who arranges a good action, my prayer, or the desire to connect to society. If all this comes from Above, then what do I ask for? And the greatest reward is that a person needs the Creator, which means the giver of the Torah. Therefore, when a person feels his lowliness, it is a reason for him to need the Creator. However, if he feels that he can help himself and that he doesn’t need the Creator, then he is separated from Him. The tenth part of an ephah of fine flour, symbolizes Malchut, which I have to give up completely since I don’t have a Masach (screen) over it, so that I can receive in order to bestow. Receiving the tenth part is always receiving in order to receive (egoistic receiving). But it is thanks to the fact that I rely on Malchut that I work with the desires that are above it which are sanctified, since when I am pushed by it and become detached from my ego I can work in order to bestow (altruistically). How could I work in order to bestow if it weren’t for the ego? The first nine Sefirot are the Creator’s attributes. How can I change myself so that I will resemble the Creator? By having the tenth part, Malchut (the ego), and when I become detached from it, I establish myself and resemble the Creator in contrast to it. Thus Jacob’s ladder, which rises above the earth, diagonally from Malchut to Bina, is formed. It says: “standing on the ground and rising to heaven.” Therefore, the tenth part in which we cannot receive cannot be used and is cut below the Sefira of Yesod. Question: We disseminate integral education and the idea of mutual guarantee to the public so that they will have a better life. But we don’t demonstrate this ourselves. Don’t we need to be an example of a society that lives according to the laws of mutual guarantee? Isn’t that one of the stages along the way? It seems that we are disorganized and are not suitable for this goal. Answer: We cannot serve as a role model because we are different, we have different values than the public. If I have a job, running water, a table, and a bed, I don’t need anything else in order to follow the spiritual path. On the other hand, the public may need a two or three-story house, a lawn, several cars parked by the house, and a swimming pool, etc. Every person has his measure according to which he can fulfill his mission in life. It turns out that we cannot be a role model for them because we live differently and have different values. Don’t go on any diets and don’t deny yourself anything for a better future. On the contrary, we bring the Light into the ordinary frameworks of your lives. We cannot and will never be a role model for others. We dedicate our life to other goals and don’t live them the way those around us would. How Can I Help The Needy People? Question: If a person loses his wallet with all his money and documents in it, it is only a corporeal problem and he has to order another ID according to this world’s laws. Internally I try to remember that there is none else besides Him and that it comes from the same force, but how is that related to the work with the group, so everything will go through it? How does my lost wallet relate to the center of the group and my connection with the friends? Answer: I try to constantly be in the center of the group, with the environment and with the whole world, and I try to bring everything that happens to me in my corporeal life through the center of the group where I am internally together with the Creator. Eventually, I also begin to see spirituality in all these corporeal actions. I see that in all the corporeal actions I actually encounter angels, which means forces, that help me in different ways: they oblige me to lose a wallet or to find it, etc. I see and understand that all these actions direct me to something else, to something new. Thanks to the lost wallet I reach certain people, talk to them, and perform different actions with them, and perhaps establish connections with them that are actually a great correction that I had to make. If I constantly adhere to the right intention doing whatever is necessary in this case, which is “not to be condemned and not to be praised,” it is a necessity and I am obliged to fulfill it in every corporeal action, and by that I raise all my corporeal actions to holiness. Then I see that these aren’t corporeal actions at all. I perform them with my hands and my feet, but who has managed my hands and my feet? The spiritual force! Did I do it by myself? No. First I thought that I performed the actions, but it turns out that the Creator performed them. In such an adhesion, I disappear on the one hand, but on the other hand, it is the outcome of all my efforts. Question: How will people measure their success in the future society? Answer: The value of success will be opposite to what is is today: to what extent, in spite of my ego, do I do everything for the benefit for the society only. I only look at the good for society and don’t expect anything for myself. This is service to others without any reward. Instead of using others so that they will serve my pocket and pride, I use myself in order to serve them. This is an opposite approach to the ego. It is called bestowal of the Reflected Light. Thanks to this approach, we begin to see reality through a collection of people, and what we discern in this form is called the spiritual world. Question: What is the Upper world? How is it possible to see it? Answer: One must invert oneself: to begin thinking about others instead of constantly thinking about oneself. It is an inverted way of perceiving reality, through the society, through the world. And instead of using everyone for my benefit, I use myself for the benefit of everyone. Question: What can give a person the strength to transform like this? Answer: It is either from great suffering until the point of “it is better to die than to live,” that can push one to this, but it won’t be possible to die, and from necessity they must transform themselves from egoism to bestowal; or through re-education, the study of the wisdom of connection, that we must provide. Since we relate to people in the correct way, we are not interested in waiting until they receive blows that force them to connect in spite of the objections that come from their nature, but we offer to use the system of correction now.